We had one glorious day in Avignon during our extended weekend at Isle-sur-la-Sorgue and instead of making it a mad-dash run to see all we could see, we opted for a morning trip to the Les Halles market and a long, leisurely lunch. The question was, as it often is in an unknown city, where to eat? Well, besides being a gorgeous city, Avignon is chock-full of restaurants – many being conveniently located along the main squares and somewhat impossible to choose from one another. With trusted guidebook in hand (and even more trusted food guide) we roamed the streets for the better part of an hour searching for the Holy Grail combo of sunny terrace, good menu, and welcoming faces. Unfortunately many of those cozy terraces along the squares also contained a fair amount of touristy and overpriced tables. So after a few calls (a promising Corsican bistro was closed for the holiday weekend), we hightailed it to the “far end” of town for the altogether delicious Numéro 75. 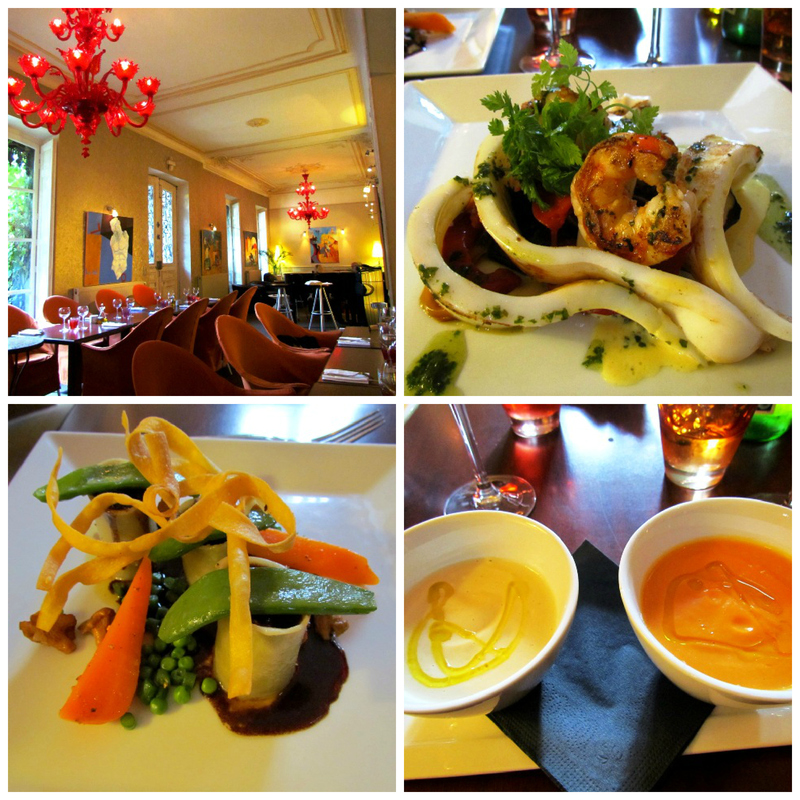 Now if the beautiful location didn’t capture us (the former “mansion” of the Pernod family), opening the menu and learning that they’d been serving the “haute” gourmet tastes of locals for the past 10 years let us know we were in the right place. And I got my welcoming faces – often no small feat in France. For my entrée, I had a sublime cream of carrot and cream of cauliflower soup, followed by a calamari & prawn “grill”. My husband opted for beef “cannellonis” and definitely got the winning plate of the two, with melt-in-your-mouth meat and a sauce I’m still dreaming about. Even with all of our frequent restaurant outings, we both admitted it’d been a long time since we tasted a dish of that level. Apart from a longer morning spent at lovely Les Halles, Numéro 75 is top on the list for our next visit to Avignon. Find more photos of Numéro 75 and restaurant info (in French) here. You landed at the best of the best. Robert and his ‘équipe’ just keep making it better and better. Great guy. This is the place where the locals go…..have frequently seen Madame Mayor of Avignon having lunch with her associates. That’s great to hear Mary James… I thought it was a good “find”, happy to know the locals agree. Can’t wait to try this restaurant Tuula – sounds wonderful! You’re right – there are so many restaurants in this city and it’s so good to find one that the locals recommend. Número 75 has been a foodie destination for a long time but we have not made it there yet. Obviously we need to go there on our next visit to Avignon. Sounds wonderful. Thanks for sharing. Oh my goodness, Tuula, the location alone is exquisite! 🙂 I’m so glad the food lived up to its promising situation. 🙂 Delicious!